An incomplete cast copper alloy strap-end of early-medieval date of Thomas Class B. The object is broadly rectangular with parallel sides and a zoomorphic terminal with rounded edges and corners that is sub-rectangular in cross section. The strap end has divided down the slit between the back and front plate with the front plate mostly missing and the attachment end of the back plate also lost to a patinated break. The small section of the front plate remaining by the terminal is plain. This terminal is worn but is thicker than the front and back plates of the strap end with a raised brown ridge, probably angled eyes and a rounded snout. The object is covered in a dark green patina showing patches of abrasion. The piece measures 32.1mm in length, 8.2mm in width, 3.4mm in thickness at the terminal and 0.8mm thick along the rest of the object and and weighs 2.00g. 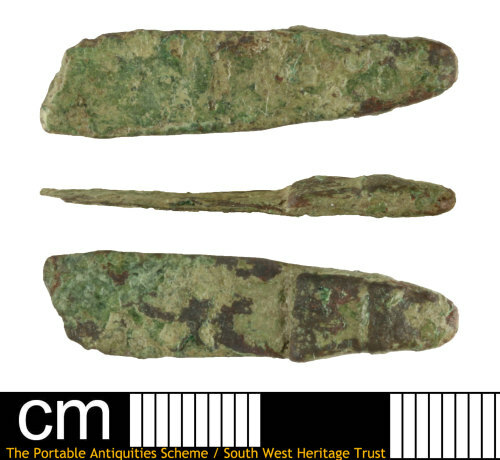 This is a Thomas Class B, Type 1 (2003, 4-5) strap end, a type which Thomas (ibid) suggests dates to between AD 775-1100. Thomas, G., 2003 Late Anglo-Saxon and Viking-age Strap-Ends 750-1100: Part I Lincolnshire: Finds Research Group AD 700-1700.